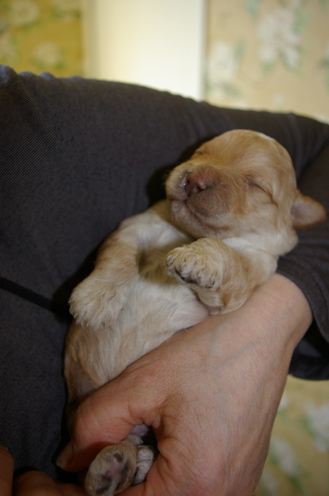 A few suggestions to keep your Labradoodle healthy from puppy to grown up. Chocolate is everywhere and most of us never get quite enough. However make sure that chocolate stays up high and out of the doggy’s reach. When it comes to chocolate even the best behaved canine companion can lapse and do a little table or counter surfing. I can hardly blame them but it can be extremely harmful. Even small amounts of Theo bromine, an ingredient in chocolate, can cause vomiting and restlessness in your dog. Larger doses can be fatal. An estimate of the smallest amount that can be fatal for a miniature Labradoodle is four ounces of milk chocolate or 1/2 ounce of baking chocolate. If you find out that your dog has eaten chocolate and there has been very little time lapse, induce vomiting. We have had good results with salt. I have quickly mixed half a cup of table salt with enough warm water to make a paste and shove it in the poor dog’s mouth. Massage his throat to get the salt down. Put in the remainder of the salt. For a larger dog I would do more salt. This will cause vomiting almost immediately and the undigested chocolate will come up with the salt. If you don’t know when the dog ate the chocolate an emergency trip to Vet will be required. So…….keep those chocolates up high! They are meant for humans only. Some fruits are good for dogs. Ours love a slice of apple. However raisins and grapes can cause damage and in some dogs even small amounts can cause renal failure. As it doesn’t always affect every animal you will hear people say that they have given their dogs raisins for years. However only a very few raisins can cause severe damage and in some cases can be fatal. It’s not a chance worth taking. Antifreeze poisoning is one of the most common forms of poisoning in dogs. Antifreeze poisoning typically happens when antifreeze drips from a car’s radiator, where it is licked off the ground by your dog because of its sweet taste. Your dog may also come into contact with antifreeze that has been added to a toilet bowl. This occurs in homes where the residents will use antifreeze during the cold months to “winterize” their pipes. Anti freeze poisoning is usually fatal. One obvious symptom is uncontrolled movement. If you believe your dog has come in contact with leaked or spilled anti-freeze take him to the vet right away. Like a toddler, puppies will but the darndest things into their mouths. We have a nephew dog, Tucker who fancied a pair of pantie hose as a snack. That was a $500 vet bill for our sister Judy. We know a lovely Bernese Mountain Dog puppy who ate a corn cob and required surgery. These things don’t happen every day but it is a good idea to be cautious. Puppies should have their own toys to chew on. Take away lego and Barbie. Puppies chew and out side in the garden if they are left alone they could chomp away on plants and things that can be harmful. Plants commonly thought of as poisonous such as Poinsettia at Christmas are harmful but are in a list of plants that are considered ‘mildly toxic’. There are generally two causes of heat stroke in dogs and puppies. The dog being left in a car in the summer time and a dog who plays too hard in the hot sun. Dogs are more susceptible to heat stroke than humans because they do not sweat through their skin like humans. They have relatively small areas through which to release heat. They pant and sweat through the foot pads and nose. Be careful in the summer and don’t leave your puppy or dog in the car even for short periods of time. If your dog wants to play fetch do it in the early morning or evening. A dog will focus on the ball and not how he feels. A dog running back and forth for a ball on a hot summer day is a very likely candidate for heat stroke. It becomes obvious when your dog is over heated. He pants very hard and he will start to loose the ability to walk. At this point it is an emergency. Do not use ice water. Extreme cold could cause blood vessels to constrict which will stop the natural cooling process of the dog’s inner core. Get your dog to the shade immediately. Place cool wet cloths all over his body. Make sure you cover the foot pads and the head and neck. Offer the dog water but don’t force water down his mouth. If you dog has been overheated to the point where his walking is difficult and his salaiva is thick a trip to the vet is in order. Heat stroke can be very serious causing permanent organ damage or death. All of us can get worms. Nasty little things they lay eggs and cause discomfort and harm if their population grows unchecked. We treat our puppies for worms regularly. Ask your vet about a worming program for your puppy. Many ailments can be traced to worms in a puppy or dog’s system. 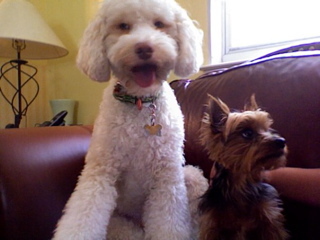 Years ago I had a little poodle who was elderly and couldn’t climb stairs. She also had a slight cough. After I treated her for round worm she was like a puppy again. 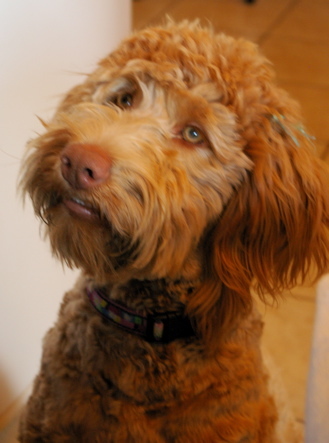 Your Australian Labradoodle puppy has been on a regular program of vaccinations. When you visit your veterinarian set up a program of booster vaccines. These take place annually. We have vaccinated for common dog ailments. There could be things in your area that don’t affect dogs here. Consult your vet to make sure your dog is protected. 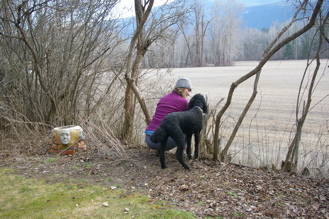 Labradoodle Grooming is a health as well as appearance issue. Regular coat care, nail clipping and ear and eye care is not just to keep your puppy looking his best. These things are part of his regular health care. A dog with a tangled coat can become uncomfortable to the point where it hurts him to move. Long nails can grow so they hurt the dog and dirty ears can become infected. We can't keep baby in our arms forever. He has to grow up and explore the world around him. It is our job to keep him safe.